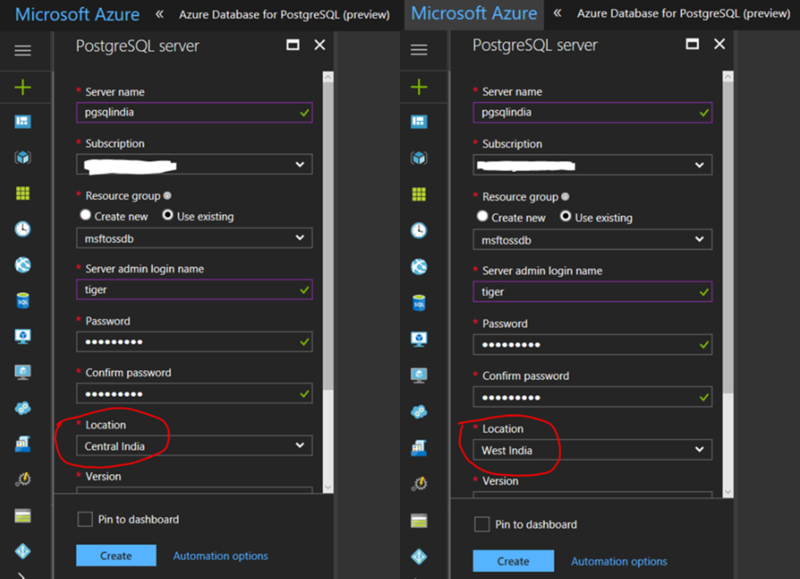 We’re excited to announce the public preview availability of Azure Database for MySQL and Azure Database for PostgreSQL in India data centers (Central and West India). The availability of Azure Database for MySQL and PostgreSQL services in India provides app developers the ability to choose from an even wider number of geographies, and deploy their favorite database on Azure, without the complexity of managing and administering the databases. The Azure Database for MySQL and PostgreSQL, built using community edition of MySQL and PostgreSQL database offers built-in high availability, security and scaling on the fly with minimal downtime, all with an inclusive pricing model that enables developers to simply focus on developing apps. In addition, you can seamlessly migrate your existing apps without any changes and continue using existing tools. 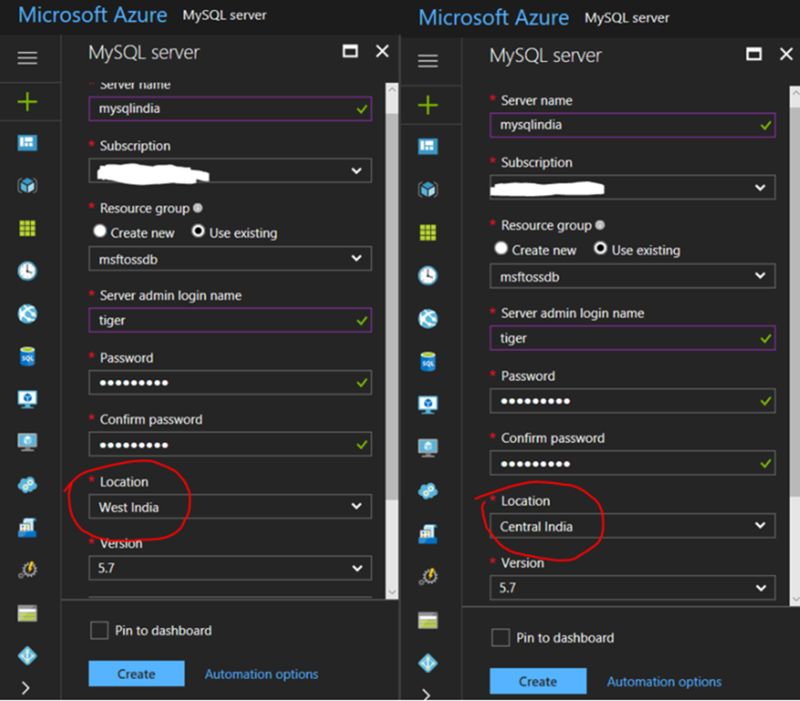 Learn more about Azure Database of PostgreSQL and Azure Database for MySQL, or just create a new database with MySQL or PostgreSQL. You can also read the public preview launch blogs for MySQL and PostgreSQL. To create a new MySQL database in one of the India data centers, follow the Create process, choosing a new logical server in one of the India data centers (Central, or West India). To create a new PostgreSQL database in one of the India data centers, follow the Create process, choosing a new logical server in one of the India data centers (Central, or West India). You can access sample PostgreSQL applications available on GitHub which allows you to deploy our sample Day Planner app using node.js or Ruby on Rails on your own Azure subscription with a backend PostgreSQL database. The Day Planner App is a sample application that can be used to manage your day-to-day engagements. The app marks engagements, displays routes between them and showcases the distance and time required to reach the next engagement. We also support deploying Azure Web Apps with a MySQL database backend as a template on GitHub. Developers can accomplish seamless connectivity for our PostgreSQL and MySQL service using native tools that they are used to and continue to develop using Python, node.js, Java, PHP or any programming language of your choice. We support development with your favorite open source frameworks such as Djnago, Flask, etc., the service will work seamlessly. If you have a sample application that would like to host on our GitHub repo or even have suggestions or feedback about our sample applications, please feel free to submit a pull request and become a contributor on our repo. We love working with our community to provide ready-to-go applications for the community at large. As with all new feature releases, we would love to receive your feedback. Feel free to leave comments below. You can also engage with us directly through User Voice (PostgreSQL and MySQL) if you have suggestions on how we can further improve the service.